In the work of the street artist from Berlin, there comes again the theme of the house, not as the place of private living, but as identifying element of more complex spaces. Starting from the repetitive obsession of the prefabricated modules of the residential constructions of East Germany, Evol proposes in his works the graphical grid of the facades always identical with themselves, causing alienation as well as attraction in the observer, forcing him to reflect on the relationship between human identity and the collectivist concept of land-use planning. 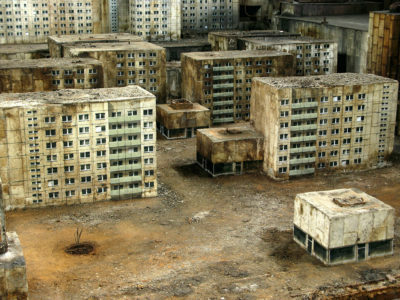 Evol transforms urban matter into miniature buildings, using spray cans and stencils. He prefers installations, mostly in real urban context, turning telephone junction boxes into mini buildings. Or he takes old office furnitures and transform them into popular residential districts of anonymous suburbs. Alongside he uses waste materials, with a particular preference for cardboards found in the street. The colour of the different materials becomes that of the facade of the building, adding windows, balconies, scaffolds, antennas and electrical cables that are repeated and multiplied with persuasive rhythm of shadows and lights, with photographic hyper-realistic effect. Old stickers, scotch or postmark leftovers testify the origin of the cardboard. Evol doesn’t forget the relationship with alive people: they are remembered in the objects and in the shades. In particular, a giant role is kept for humans in Hamburg, for the MS Dockville Festival, where he builds an underground miniature city, under the walking level, with streets that are large enough to let the people walk in them, as giants in the mini town.